PITTSBURGH (AP) -Locked in a tight battle for one of the Eastern Conference's top seeds, the Pittsburgh Penguins had a disappointing first 40 minutes. A good 16 seconds in the opening minute of the third period made up for it. Evgeni Malkin had a goal and an assist, and the Penguins moved into a tie for first place in the Atlantic Division with a 4-2 win over Tampa Bay on Thursday night. "The first two periods we were playing sloppy, and that's not acceptable right now," said Pittsburgh's Jarkko Ruutu, who scored his fourth goal. "We have to learn that. The little things make the difference. That's what we did in the third." Jordan Staal and Petr Sykora scored 16 seconds apart during the first 51 seconds of the third for the Penguins, who have won four of five and beat Tampa Bay at home for the first time since Nov. 2, 2002 - a span of eight games. Pittsburgh and New Jersey both have 91 points, one fewer than Eastern Conference-leading Montreal. "It was a tight game going into the third, and we were working pretty well down low but the puck wasn't going in for us," Staal said. "And then we get a couple quick goals, got a little breathing room there and just played our game." Filip Kuba and Vincent Lecavalier each had a goal and an assist, and Jussi Jokinen had two assists for the Lightning, who allowed six third-period goals to Buffalo in a 7-4 loss Wednesday. That defeat also included two Sabres goals 16 seconds apart early in the third. "That's hard to believe," Kuba said. The Penguins took a 1-0 lead 14:20 in when Ruutu scored his fourth, slamming in a rebound of Brooks Orpik's shot while standing to the right of goalie Mike Smith. Ruutu then took a stick to the face from Lightning defenseman Dan Boyle, drawing a penalty as he scored his second goal in two games and first at home since Feb. 6, 2007. Ruutu was bleeding profusely and required 10-to-15 stitches before returning to the game. "I want to win hockey games. I don't care what I look like," Ruutu said. Lecavalier tied it on the power play 4:18 into the second when his wrist shot appeared to hit Orpik's hand before getting by sprawling goalie Marc-Andre Fleury. This is the second consecutive season Lecavalier has had at least 40 goals. He scored an NHL-best 52 last season and has 90 points to rank third in the NHL behind Washington's Alex Ovechkin and Malkin. "When you don't make the playoffs, (the scoring race) is not as gratifying," Lecavalier said. Malkin tallied his 42nd less than 6 minutes later. Ryan Whitney made a nice play to keep the puck in the zone and fed Malkin, who was just left of Smith. Malkin's first shot was blocked by Kuba, but he backhanded the rebound under the crossbar to make it 2-1. It was that way going into the third before Staal scored his 12th of the season and third in five games 35 seconds after Pascal Dupuis stole the puck from Smith. Just 16 seconds after that, Sykora netted his 26th. Sykora was then called for hooking 22 seconds later, leading to Kuba's power-play goal, his fourth of the season and first since Dec. 4. Pittsburgh allowed the Lightning few chances after that. "We played extremely well in the third period," Penguins coach Michel Therrien said. "The kind of hockey that we are capable of playing." The Penguins have eight games to play - two against each division rival. Despite being only a point out of first in the conference, they also only lead the sixth-place New York Rangers by four points. "It's such a tight race, you know?" 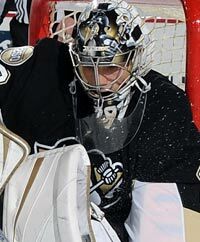 said Fleury, who made 19 saves to improve to 5-1 since returning from an ankle injury. "Every point we can get is good for us." Notes: Malkin has 99 points, three behind Ovechkin. ... Penguins captain Sidney Crosby missed his fourth straight game - and 25th of the past 28 - with an ankle injury. ... Tampa Bay RW Martin St. Louis played in his 600th NHL game. ... Tampa Bay killed both Pittsburgh power plays and has been successful 14 of the past 15 short-handed situations.